Painting tropical landscapes. Create scenes filled with abundance! 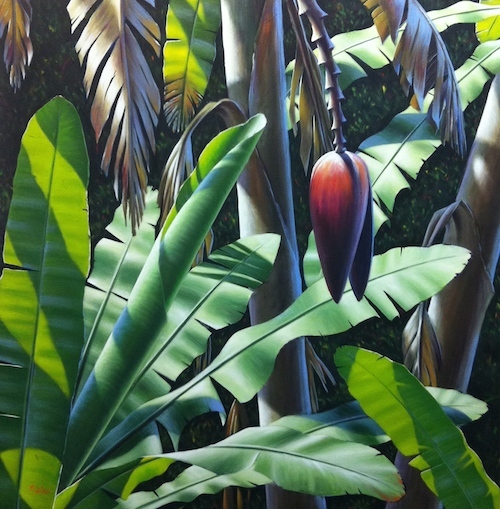 Go bananas with your tropical landscape paintings. Surrender to colour without losing your eye for subtlety. 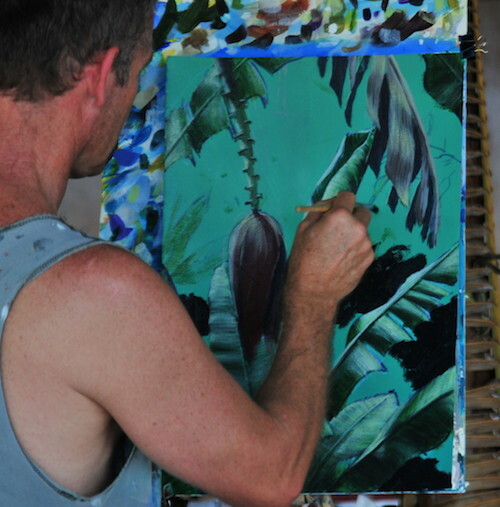 The greatest thing about painting tropical landscapes is COLOUR. In the middle of the day in the tropics, when light is bouncing around everywhere - gorgeous, bright clean colour abounds. Pinks and reds stand out amongst the brightest greens. When painting “normal” landscapes, we tend to diminish some of the colours and break them down. 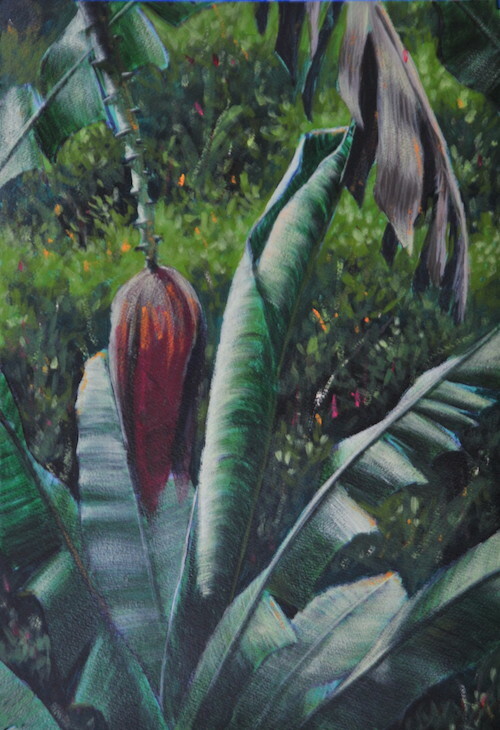 Painting tropical landscapes is a great excuse to dig in and use as much colour as you possibly can. It’s a great idea to study the picture you intend to represent and make a small colour map. By that I mean go through the image and identify all of the bright, strong colours, and all of the major areas of colour. 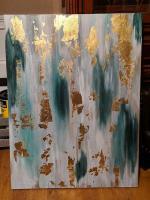 Then go and physically mix up these colours on a piece of scrap canvas or paper. 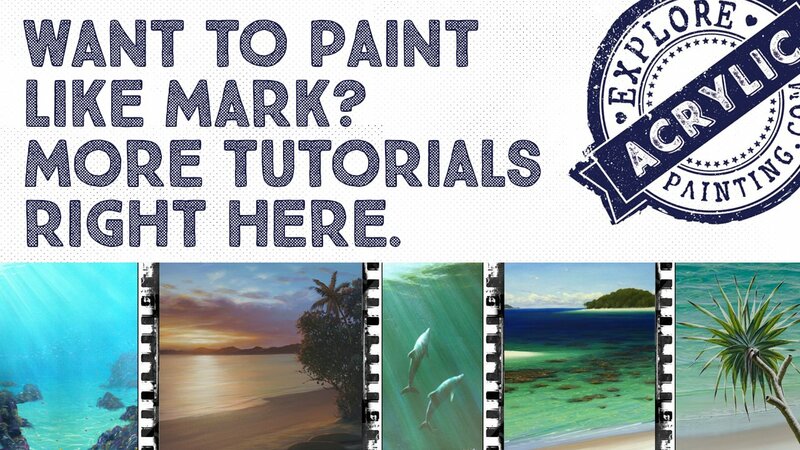 You’ll go into your painting already aware of how to mix them. Keep the colours as clean and “pure” as possible. (Don’t break them down with too much white, or dirty them with too many other colours). As a rule, mixing cooler colours with other cooler colours, will keep your colours bright. Avoid mixing too many warms, and/or adding them to your cools. 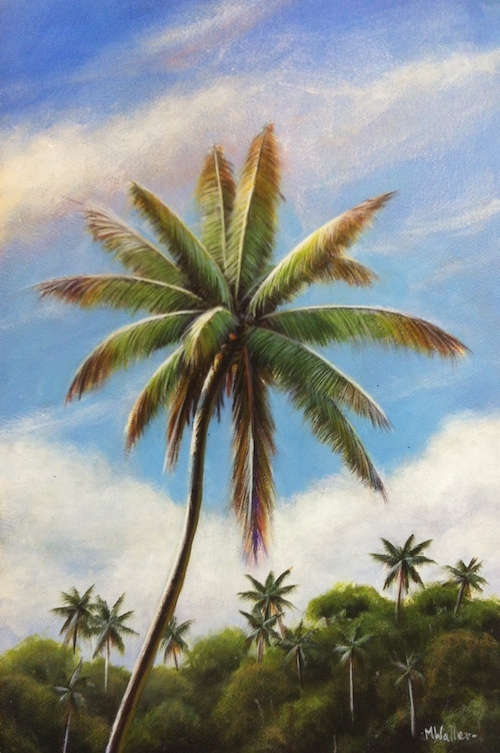 The funny thing about painting tropical landscapes, is that you may expect everything to appear “warm”. Of course, the temperature can be! But paradoxically there are cool colours everywhere. 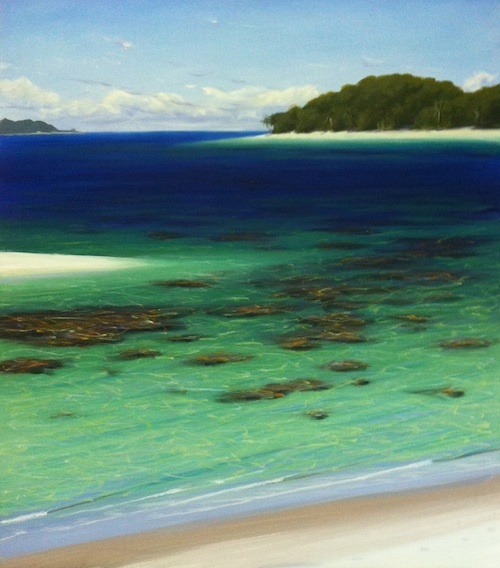 Pthalo Blue, Permanent Alizarine and Cadmium Yellow Light are sensational colours for painting the tropics. Remember though, this rule changes depending on where the sun is in the sky. Whenever it’s sunset or sunrise, the colour range is diminished, and the cooler colours are also diminished. 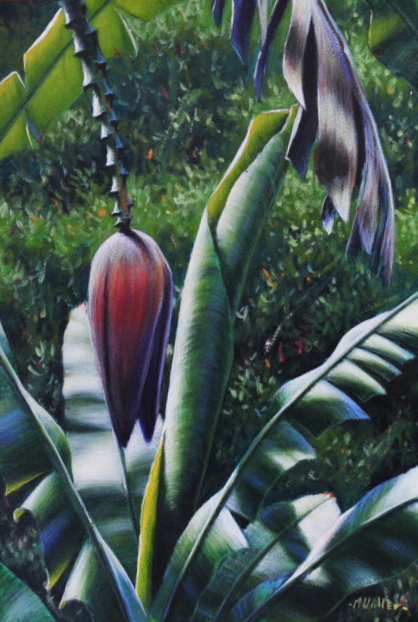 The other great thing about painting tropical landscapes is LEAVES. Sounds funny I know, but you often get giant leaves, like banana leaves in the tropics. These are huge slabs of lovely green. However, these large areas of green do have nuance. Make sure you look for the reflections. On these giant shiny leaves there will be different blues reflected on different parts of the leaves. Some will have direct light, and some will be backlit. So much interest in just one leaf. And….we haven’t even started on the dead ones! Have a really close look at them too. More opportunities for more colour! Coconut trees are synonymous with the tropics. When you look closely, it’s incredible how much colour there is in them. Skies. The tropics seem to accentuate sunsets. Whether you are on a small tropical island or in the heart of Asia, there is something about the air. Often in major land masses, there is a lot of smoke, moisture and dust. This “softens” the light but still allows lovely vivid reds, pinks and yellows. These can be diffused with soft transitions. The sunsets on small tropical islands however, often have a different feel. They can be less subdued and very intense. There isn’t the dust and smoke to diffuse the light. A little harder to paint, but no less spectacular. Diminish the strength of the colour as you recede into the distance. 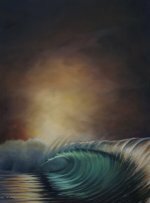 You can do this by using a loaded brush in the foreground, and a softer touch with a dryer brush in the background. Jungle scenes are busy. Dance with your painting. Add and subtract until you get the composition right. Don’t let the bright colour overwhelm you. Keep looking for nuance, eg reflections from above, behind and below.